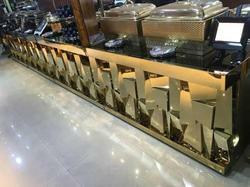 We are a leading Manufacturer of golden design catering counter from New Delhi, India. We are offering Catering Counter to our clients. The product range redefines the dimensions of traditional steel in India, which have been creatively designed in combination with Solid Surface, wood, acrylic, Glass and various other materials illuminations etc., to not only enhance its aesthetic appeal but make it functionally effective as well. The in-house design studio bridges the gap between the real and surreal in the world of steel & its fusion. It has a team of professionally qualified designers who are dedicated to explore the challenging frontiers of design and are committed to deliver aesthetic delight in functional forms to Hospitality Industry for Food Service solutions. In today's lifestyle arena, especially austenitic steel & fusion segment, it is for the first time that synergies between steel and various materials has been explored to create an edge over traditional available designs in quality, which are functional, & affordable. 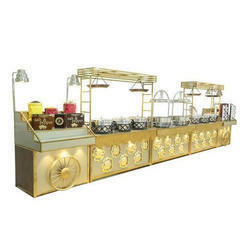 Owing to the changing needs of customers, we are engaged in manufacturing, supplying and exporting a large range of Golden Catering Counter With Steel Framing. Our offered product is used in the market for displaying things and exported by us across the world. The product of our company finds applications in malls, shops and many more places for displaying purpose. Besides these, we offer product to the customer as per the latest trend.